Women's thumb rings can be traced back to ancient Rome, where it was fashionable to adorn all five fingers with multiple rings. Julia Roberts helped revive the style when she wore one in the 1991 movie "Dying Young," according to rings-4-u.com. Women wear thumb rings for a variety of reasons. The thumb's size, thickness and strength (it's the strongest finger on your hand) makes it ideal for wearing rings that have thicker bands or are oversized. Women who like to wear a lot of rings put them on their thumbs because it's one more finger they can use for displaying their jewelry. 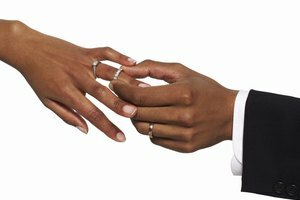 A woman who wears a ring belonging to her boyfriend or a widow who has her husband's wedding band may put them on their thumbs since it's wide enough to hold the thicker band. Fashion-conscious ladies will wear thumb rings if the trend experiences a resurgence in popularity. 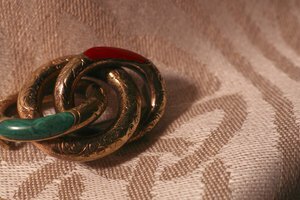 In the 1990s, it became a trend for lesbian and bisexual women to use the rings as a sign of their sexual orientation. Since many ladies don't typically place a ring on their thumb, individual- or nonconformist-minded females use the jewelry to express their personalities. 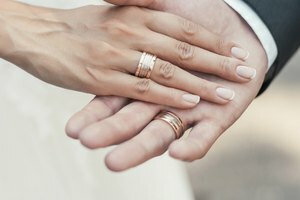 WeddingRingOrigins.com: Origins of the Wedding Ring - Fingers in Pagan History - A Lesson From Ancient Rome. 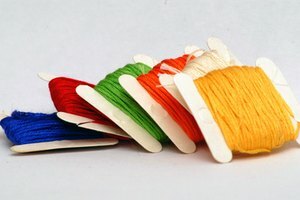 VelvetParkMedia.com: How Do You Know a Dyke Is a Dyke?